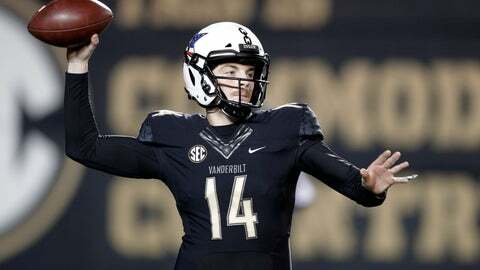 NASHVILLE, Tenn. (AP) — Kyle Shurmur has been chasing down a handful of Vanderbilt passing records held by Jay Cutler all season long. Now the senior quarterback is poised to do something Cutler never managed. Shoot, no quarterback alive has done what Shurmur can do on Saturday: Beat in-state rival Tennessee three straight times. Why, Vanderbilt hasn’t won three straight against Tennessee since before the Southeastern Conference was formed. The last time the Commodores won more than back-to-back games in this series was a six-game streak between 1920 and 1926. And Shurmur is a very big reason why the Commodores have a chance at a winning streak not seen in nearly a century. Shurmur, whose father, Pat, is head coach of the NFL’s New York Giants, took Vandy’s career passing TD mark last weekend with No. 60 in overtime to beat Mississippi 36-29. That topped the 59 TD passes Cutler threw. Now Shurmur will make his 40th career start needing a victory for a big piece of school history and a second bowl berth in three seasons for the Commodores (5-6, 2-5 SEC). Shurmur ranks second to Cutler in four other passing categories, and he needs 486 yards against the Vols to take the career passing yards mark (8,697). If he completes 38 passes, he would improve on Cutler’s 710 career completions and 51 attempts would top Cutler’s record of 1,242. Considering the quarterback’s past games against Tennessee, those marks aren’t out of question. Shurmur threw for a career-high 416 yards in a 45-34 upset of then-No. 24 Tennessee on Nov. 26, 2016, and he threw four TD passes in a 45-24 win in Knoxville last season. Asked Tuesday why Shurmur has been so good against Tennessee, senior center Bruno Reagan said it might just be the offense coming together at the end of the season. “But he hopefully better do it again,” Reagan said. Shurmur said he doesn’t think he plays better simply because the opponent is Tennessee. He agrees with Reagan that he’s benefited from getting experience with teammates over the course of a season. “It’s a new year, and we’ve got a new challenge ahead,” Shurmur said. The 6-foot-4, 225-pound Shurmur is 205 of 334 for 2,477 and 20 touchdowns this season, making him the first quarterback in Vanderbilt history with at least 20 TD passes in two seasons. He started five games as a freshman and has been helped this season by receiver Kalija Lipscomb and tight end Jared Pinkney, and Vandy also has a strong run threat in Ke’Shawn Vaughn. Shurmur, now with a moustache he says took all of November to grow just for the Tennessee game, says he’s treating this like any other game. “We can sit back, rub elbows and talk about it’s our last game or whatever (later), but right now I’m treating it like any other game and it’ll be a fun one,” Shurmur said.